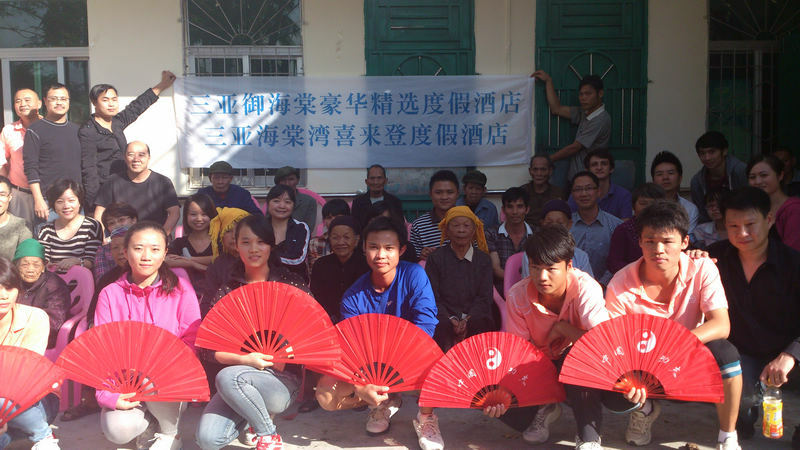 On January 19, 2013, The Royal Begonia, A Luxury Collection Resort, Sanya and Sheraton Sanya Haitang Bay Resort’s Hotel Manager Mr. Aaron Loy and a party of 30 staffs visited the Seniors’ home at Fenghuang Town of Sanya City and send them daily necessities and New Year’s Wishes. Before this trip, hotel discussed with the seniors’ home caretakers about what were their urgent requirements. After that, the hotel prepared two water boilers, quilts, towels, rice, oil and daily necessities for the seniors’ home. At 4 o’clock in the afternoon, the elderly people sitting in the yard under the sun appeared particularly happy upon our arrival. Firstly, Hotel Manager Mr. Aaron Loy represented our hotels in bringing New Year’s Greetings and Wishes to the elderly people of the seniors’ home, wishing them happiness in the New Year and good health. Soon after, six colleagues from the Recreation Department performed a Tai Chi fan dance. The elderly people all watched engrossingly. After the performance, everyone started getting busy cleaning the rooms, sweeping the yard, cleaning the windows and washing the dishes. The colleagues from the engineering department also started installing two water boilers for the seniors’ home. The Royal Begonia By Abel Touch Spa’s barber, Mr. Li Zheng cut hairs for the elderly people. Soon after, Hotel Executive Chef Tat Jui How invited the elderly people to enjoy delicious meat porridge and desserts together. According to the peak seniors’ home caretakers, “Fenghuang Town’s Peak seniors’ Home in Sanya has an area of about 1,000 square meters and has 21 elderly residents of Li nationality. The oldest of them is 100 years old. They all have no children, only themselves, this is their home.